Hong Kong Federation of Business Students (HKFBS) proudly presents the FIRST and ONLY 9 universities business programmes consultation event, University Consultation Day (UCD), exclusively for secondary school students! 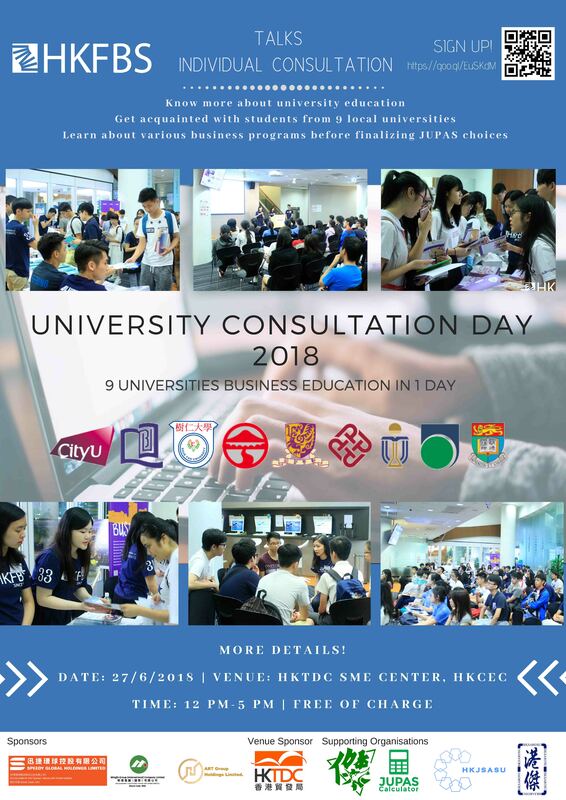 University Consultation Day 2018, advocates business education to the current F.4 to F.6 students who are interested in learning more about different Business programmes before finalising their JUPAS choices. In this meaningful event, HKFBS will be collaborating with the 9 Business Schools such that leaflets, admission scores, detailed information about each individual business courses could be provided to participants. Talks and individual consultation booths with Student Representatives from the 9 business schools are featured. Sign up on or before 27th June, 2018.